Arnold confirms that he is finished filming all of his scenes for “Terminator: Genisys”, the new Terminator film that will hit theaters in July of 2015. This should be the big summer movie and I can’t wait! I’m a huge Terminator fan and so happy that Arnold is back in the role. I’m sure Arnold’s role will be more than just a cameo. I’m sure Arnold will have a few big fight scenes. What do you think? Do you think Arnold has what it takes to play the Terminator at this age? I’d say yes. Arnold is still doing action films doing his own stunts so I’m sure he did fine. This is a new Terminator reboot so this film will have nothing to do with the past films. A new introduction and a new beginning. I think Arnold is still on for one more Conan film so hopefully that happens soon! "Game of Thrones" actress, Emilia Clarke, who is most-famous for playing the role of Daenerys Targaryen aka the khaleesi has officially signed on to play Sarah Connor for the upcoming Terminator reboot film currently titled, "Terminator: Genesis". This would make the second "Game of Thrones" actress to play Sarah Connor 'cause Lena Headey played the character for "The Sarah Connor Chronicles" TV show. The question is will she be starring alongside, Arnold Schwarzenegger? Will he be back to say the famous catchphrase, “Ah’ll be back” again? It is still not yet known whether or not Arnold will be down but he has expressed interest in returning in some form so anything is possible. Never rule out a leading role return for Arnold as the Terminator ’cause that can be a possibility too. Now that Arnold’s done with politics, I can see him returning to the Terminator on a full-time schedule. 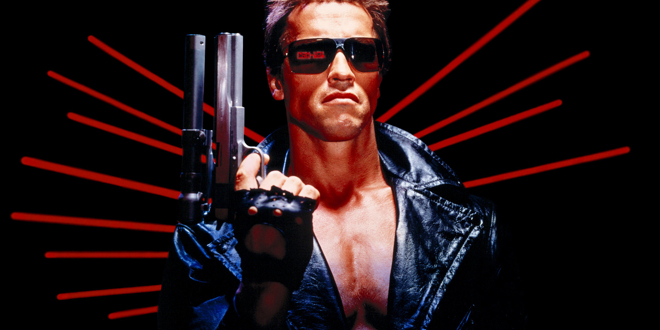 I’m almost 100% certain that the Terminator re-boot was written for Arnold to return. He’s already set to return as Conan but we’ll soon know if he’s ready for the Terminator. I won’t see the movie if Arnold’s not gonna be in it. While I hate re-boots… I think the Terminator series deserves a re-boot ’cause “Terminator: Salvation” was garbage. Lets hope they do a better job, next time around. The Terminator deserves a great movie again! The story of John Connor and Skynet deserves to be told better. Paramount Pictures has finally greenlighted, “Terminator 5”; however, this will be a new trilogy. The story for T-5 will not continue after, “Terminator III: Rise of the Machines”. Paramount has set a release date for the new Terminator film in July of 2015. The last Terminator film was, “Terminator: Salvation” starring Christian Bale and Sam Worthington — that film was a prequel of the first Terminator film. While this sounds exciting but to be honest, I’m a little skeptical and disappointed. First of all, I think they should have continued from the original series so they can finish the story of Skynet and John Connor. Secondly, no matter how many sequels and reboots they do with the Terminator franchise — they can’t have much success without James Cameron helming. I mean, why do you think “Rise of the Machines” and “Salvation” weren’t that much of a success? By the way, I didn’t think “Rise of the Machines” and “Salvation” were bad films — I thought they were pretty good actually. James Cameron made the first two movies for what they were. It was Cameron who made these movies special. I thought the first, ‘Terminator” and “T2: Judgement Day” were absolute masterpieces for sure. Would they ever top what Cameron did to the films? I don’t think so, it’s gonna be tough. Plus will Arnold return? No word yet but I’m sure he will in some form. To those who mistakenly think Arnold would be too old to be playing Terminator again — don’t badly judge this early. Arnold still can do action movies very well. After what he did with “The Expendables 2” and his latest movie, “The Last Stand” (which was very good, btw) — I think the Governator still has what it takes to play Terminator again for sure. Hope they hire a good director; although, it wouldn’t surprise me that Hollywood will try to talk Christopher Nolan or Ridley Scott to direct the next Terminator film. I would prefer James Cameron to jump back on board. I doubt Cameron would ever go back to Terminator again but you never know. Report: Megan Ellison wins Terminator rights!!! “The Terminator” franchise has finally found its owner. That new owner happens to be a woman named, Megan Ellison, who runs her film company, Annapurna Films. She successfully won the rights in a bidding auction with Lionsgate studios. For a long time now, “The Terminator” franchise had trouble with copyright issues, most notably with Pacificor. Now “The Terminator” has finally found a new home. Megan Ellison has set a deal to make two “Terminator” movies that will star Arnold in the leading role and Justin Lin to direct. It was said that Justin Lin will direct the film, only if the script is good enough. This is sounding like a re-boot is happening for sure. Starting the “Terminator” franchise over again. I’m sure Linda Hamilton won’t return because she’ll be too old for the role, but if they can’t get her, they should get Lena Headey from the “Sarah Connor Chronicles” to play Sarah. A lot of people are laughing at Arnold that he’s too old for the role of course, but everyone did the same to Sly when he was playing Rocky and Rambo for one last time. Sly was successful at playing Rocky and Rambo for one last time. If Sly can do it, I’m pretty sure Arnold is capable enough of playing the Terminator for a few more films. Arnold is not that old, he’s younger than Sly. Yes, Arnold is officially back with the Terminator but don’t expect him to get back into action movies this soon. The Governator is set to star in a drama film called, “Cry Macho” which will be directed by “The Lincoln Lawyer”, director Brad Furman. The filming for “Cry Macho” will begin as soon as possible later this summer. Arnold is signing on to projects like crazy. First announced was the Marvel project with Stan Lee for “The Governator” cartoon series & comic, then he announces action thriller “The Last Stand”, earlier this week he’s officially in for the next “Terminator”, and now this. I’m glad Arnie is getting away from politics and getting back where he belongs, in the movies. As for “Cry Macho”, I wonder if he’s going to try to get an Oscar nod for this movie. Arnold’s never done a serious drama film in his life. They’ve all been action flicks. Sure, Arnold has done a few other genres. He’s done a few comedies like “Kindergarten Cop”, “Junior”, “Twins”, and he’s done a few thrillers like “End of Days” & “Collateral Damage”. He’s even done some sci fi films like “Total Recall” and “The 6th Day”. Do you think people would care to see him in a drama? We’ll wait and see how the box office does with, “Cry Macho”. I don’t think Arnie will get an Oscar nod for that film. I can’t blame him for trying something different for once. Report: Arnold to star in a superhero movie???? Arnold Schwarzenegger, the former Governor of California, spent all weekend at the Arnold Classic Bodybuilding Competitions, he does every year. Well Arnold held a fan Q & A session there and the Arnold fan website, The Arnold fans, reported that they asked Arnold himself on what scripts he’s looking at for his big return to the movies. Arnold reveals he is looking at 15 different scripts. Of course, the next Terminator movie is one of them. He also announced that remakes of “Predator” and “The Running Man” are in there too. Most surprisingly, Arnold said something about that he is getting together a film on which he will play a comic book character which he didn’t name. He will announce the comic book movie he will be in, sometime later this month or in April. Arnold is no stranger to starring in comic book movies. The Conan franchise was based from the comics and so was the, Red Sonja movie. Also, Arnie was Mr. Freeze in, “Batman & Robin”. What could his next comic book movie be? I’m thinking it could be Sgt. Rock or Doc Savage. Those movies were attached for him to star but those projects were scrapped since he got elected, Governor. Now that he’s done, maybe both films will actually happen? I too am looking forward to seeing what his first movie back in Hollywood would be. I hope it’s an action movie.